Cathrine Prenot: Why Math Matters. July 29, 2016. Panoramic view of the back deck of the Bell M. Shimada from the wet lab. There is a book on the bridge of most sailing vessels called “The American Practical Navigator.” Most people call it Bowditch, for short. It is a thick tome, and has an insane wealth of information in it, as Nathanial Bowditch vowed to “put down in the book nothing I can’t teach the crew.” He evidently thought his crew could learn anything, as Bowditch is an encyclopedia of information. You can find distances to nearby planets, how magnetic fields change around iron vessels, what to do if you are lost at sea, what mirages are, and rules to navigate around hurricanes. It’s been updated multiple times since Bowditch’s version in 1802, but one fact has remained. There is math—oodles and oodles of geometry and algebra and calculus—on every page. In fact, a lot of the Bell M. Shimada runs on math—even our acoustic fishing is all based on speed and wavelengths of sound. Screenshot from the Bell M. Shimada’s Acoustics Lab showing the visual rendition (left to right) of 18,000Hz, 38,000Hz, and 120,000Hz. The ocean floor is the rainbow wavy line 250-450meters below. This was transect #38; we fished the red/orange splotches approx 150 meters deep. They were all hake! Sonar was first used in World War I to detect submarines, and began to be used to sense fish soon after the war ended, with limited success. Sonar advanced rapidly through World War II and fishermen and scientists modified surplus military sonar to specifically detect ocean life. 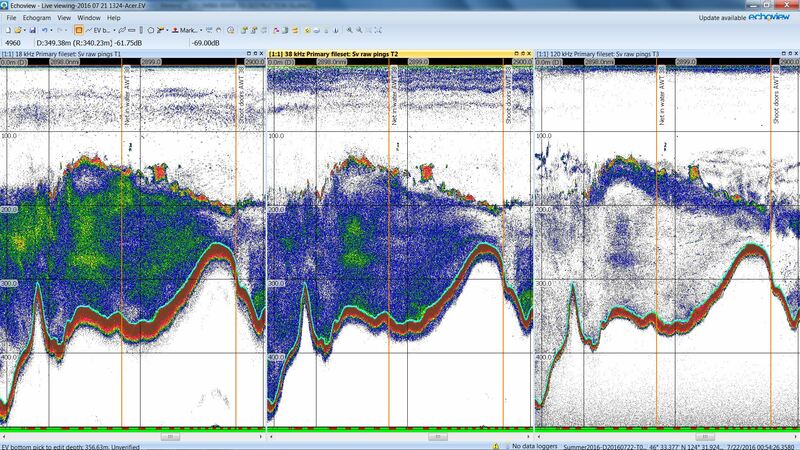 Since sound will bounce off “anything different than water,” we can now use different frequencies and energy to determine an incredible amount of information on a fish’s life. We can “try to tell what kind of fish, where they are, map vertically what they do, and determine their density.” The chief scientist, Dr. Sandy Parker-Stetter says it best. “My job is to spy on fish.” In my opinion, Sandy seems good enough to be in the Acoustics CIA. 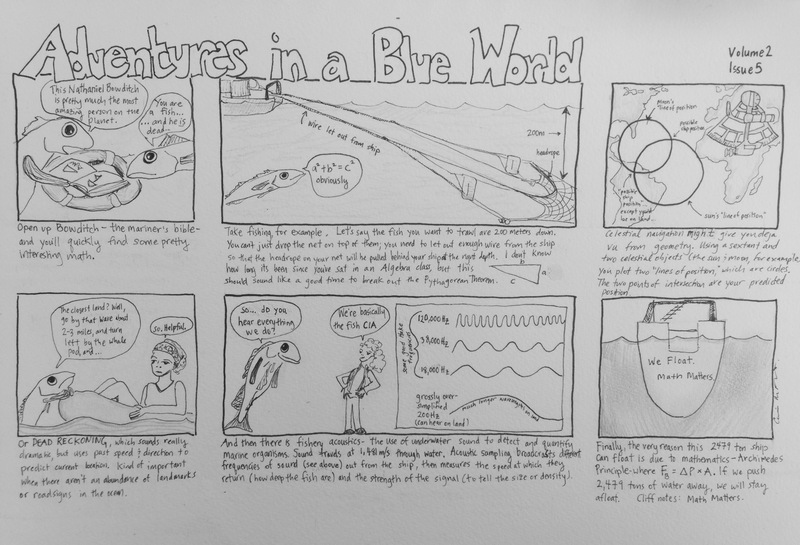 Click on Adventures in a Blue World; Why Math Matters, to learn all about fish spying and other reasons you should pay attention in algebra class. Adventures in a Blue World, CNP. Why Math Matters. Life onboard continues to be interesting and fun. The wind has picked up a bit, which has translated into higher seas. I tried to film the curtains around my rack last night opening and closing of their own accord, but every time I’d pick up the camera, they’d stop. I did get a few seconds of some wave action outside the workout room; riding a bike is now much easier than running on the treadmill. Pushups are insanely easy when the ship falls into the waves, and ridiculously difficult when rising. I’ve also been involved in a chemical spill drill (that does say drill), and was lucky to be given the helm for a brief moment on the Bell Shimada. 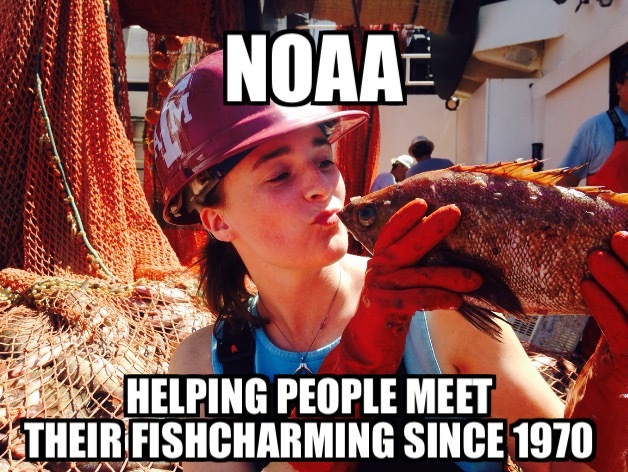 NOAA has been around since 1970! 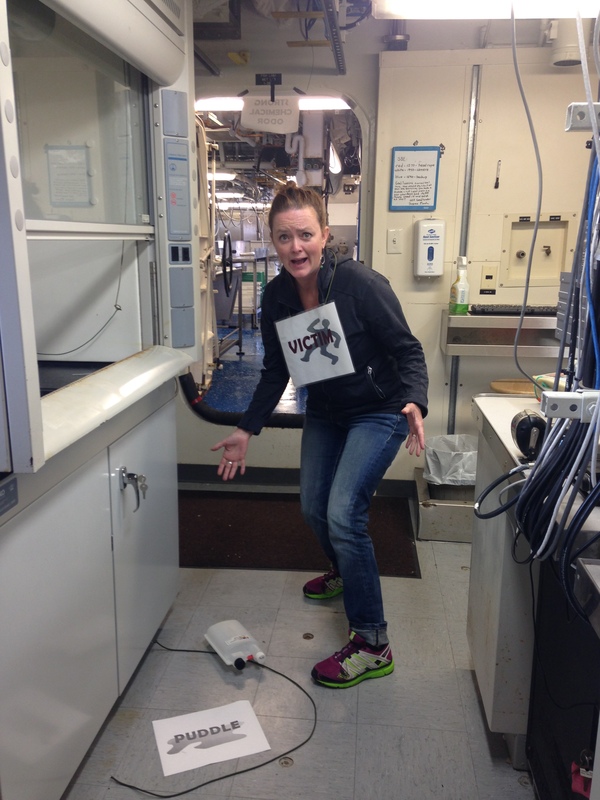 Thanks to our great Survey Tech Kathryn Willingham for keeping our science team working so seamlessly. Well… …and making it fun too. Ocean frequencies: explore sound in the ocean. Check out this great TED talk about the importance of mathematics at sea. 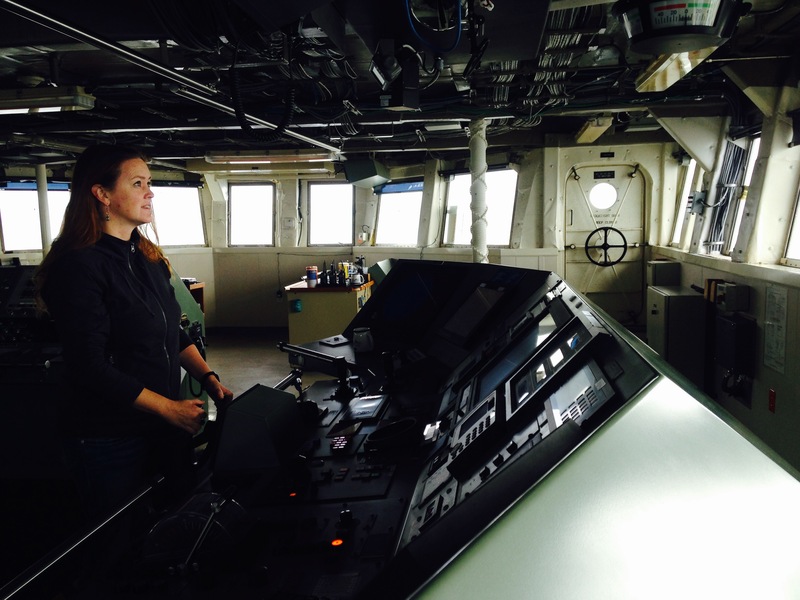 This entry was posted in 2016, Cathrine Prenot 2016, NOAA Teacher at Sea and tagged Bowditch, math, navigation, NOAA Ship Bell M. Shimada, safety drill. Bookmark the permalink. Love the integration of math, science, history, art, photography, drama/comedy in your blog, Cat. And, done–seemingly–effortlessly. Great read. This coming school year not only will the kids in science benefit from your shared experience, so will the art students and the journalistic students. You are quite the educator!